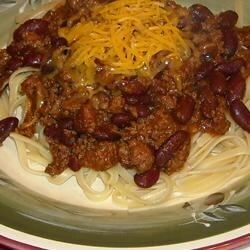 "This is a Texas style chili recipe with beans. It also uses hamburger rather than chuck. Leaving behind a small amount of the hamburger fat gives it that unique Texas chili taste." In a stockpot over medium heat, brown the ground beef until no longer pink. Drain off grease, reserving 2 tablespoons to remain in the pan. In a small bowl, stir together the garlic powder, chili powder, cumin, and flour. Sprinkle the mixture over the meat, and stir until the meat is evenly coated. Stir the oregano into the meat mixture, then pour in the 2 cans of beef broth. Season with salt and pepper. Bring to a boil, then add the cans of beans. If you like your chili soupy, add only 2 cans of beans, but if you like thick chili, use all three. Reduce heat to low, and simmer for 30 minutes to blend flavors. I've made many different types of chili before and this is the first one that I've been able to get my kids to eat. However, I decreased the amount of chili powder in half. I made this recipe as directed. I really liked the flavor of this chili and I will be using this chili recipe to put on top of my fry bread for Indian Tacos. Thanks so much for the recipe.